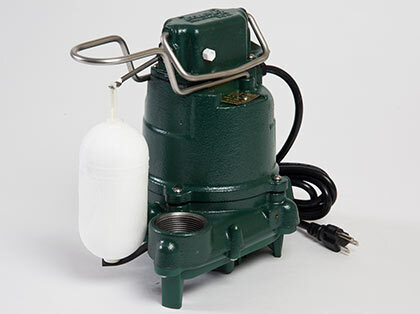 Basement Systems uses Zoeller pumps in our sump pump systems because these pumps outperform other pumps in all important categories: pumping volume, build quality, durability, clog resistance, quiet operation and float valve reliability. 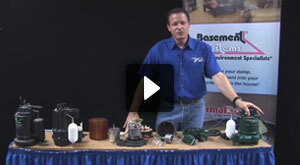 A sump pump is the heart of a basement waterproofing system. When the water level in your sump pit rises, your sump pump must come on automatically and eject the water to the exterior. 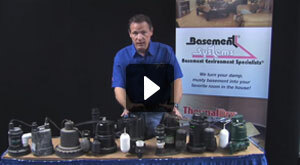 If your sump pump can't handle water volume and run time requirements, your basement is likely to flood. Zoeller submersible pumps are 100% factory-tested underwater for dependability, ensuring that you're installing a sump pump system that will provide years of trouble-free operation and performance. Some of the cheaper sump pumps on the market are manufactured using light-gauge sheet metal and plastic for housings and other structural parts. These materials don't react well to the heat and vibration generated by a hard-working motor. As a result, parts are much more likely to loosen, deform and misalign over time, shortening pump life. Cast iron housings perform much better than plastic & sheet metal housings at heat dissipation and vibration dampening. Epoxy coating provides excellent corrosion resistance. Permanently lubricated, heavy-duty bearings can handle long run times with no problem. High-volume pumping capability: 2600 gal./hr. for model 53; 3600 gal./hr. for model 98. Highly clog resistant. Innovative impeller design facilitates pumping of up to ½-in.-dia. solids. Mechanical, linear-motion float switch will not snag or jam like "ball-on-wire" float switches. Every pump is factory tested before shipment. Rubber couplings on discharge line help reduce pumping noise. Watch our videos for the inside story on what makes Zoeller pumps run longer and stronger. To get a high-quality sump pump system equipped with a Zoeller pump, contact Basement Systems to find a certified installer in your area and get a free cost estimate on your sump pump installation.